Members of the “Who’s Who” of CMO/CDMO leadership are pursuing robust growth strategies to keep the CDMO segment energized and interesting. Acquisition has become a favorite tactic by contract pharma’s most prominent players, but there’s more than one path to sustained growth, especially for those seeking the scale, global presence and technical acumen the bio/pharmaceutical industry is demanding. Until recently, contract service organizations solely functioned to provide manufacturing or development support to drug sponsors. Owners were simply service suppliers, hired to handle relatively discrete elements of a drug’s development, clinical trial or commercialization phases. Intellectual property and risk were well compartmentalized. For the most part, these primarily tactical relationships generally served the industry well, framed by branded pharma’s established, monolithic blockbuster business model. But these practices, dubbed “Pharma 1.0” in an industry report by Ernst & Young,1 became weighed down by diminishing returns, aging, inflexible processing capacity and a complex, contradictory regulatory environment, which ultimately became unsustainable. There is mounting statistical, financial and anecdotal evidence showing that gains in momentum, fueled by regulatory reform, successful new business models and biopharma’s dynamic influence, have energized the entire sector. The industry’s reformation is far from over, but in the last two decades bio/pharma has worked to realign itself operationally, responding to a broad range of familiar competitive and market drivers. Part of this response (along with continued consolidation) includes engaging contract service partners at all levels of drug development and commercialization. Current market trends show contract services providers are continuing to play an increasingly strategic role, contributing to the global supply of pharmaceuticals. These top-tier CDMOs have become increasingly visible as industry leaders. For example, VisionGain predicts a strong revenue growth for CDMO market leaders between 2013 and 2025.3 Analysts say DPx Holdings and other leaders, including Lonza and Catalent, will experience the greatest increase in revenue between 2014 and 2024. Catalent and Lonza, in particular, were cited as having invested heavily in high-potency API and antibody drug conjugate facilities, a couple of high-value, high-potential competencies that executive leaders are betting will drive revenue streams and fuel potential growth. Indeed, the CDMO industry is certainly poised to grow substantially in the year to come. The global contract pharmaceutical manufacturing market is speculated to grow by 7.5% annually, reaching a value of almost $80 billion in just three years.3 However, the number of major CDMO players will likely shrink as businesses mature and consolidation occurs. The geographic distribution of CDMOs can also be expected to change. The top question for CDMOs operating in this landscape is centered on growth; namely, how is it possible to grow in this environment? Companies with serious growth ambitions need to map out their long-term trajectory — however the path is not always clear. “Choose your path carefully” is a mantra to live by. Prudent strategists looking to assess a sound growth plan begin by performing an internal capability assessment in addition to conducting market or competitive research. Best practice informs business development leadership to seek depth and diversity in their research, collecting as much good information as possible, from both interviews and data from respected sources. The information and analysis that results will form the foundation of solid viable growth strategy —leveraging one’s strengths, capitalizing on opportunities, and identifying achievement gaps. Get to know the strength and unique capabilities of your key executives and staff. Understand your companies culture — is it a highly innovative environment, a culture that values operational excellence/efficiency, quality, customer service and discovery? Is it a diverse multicultural organization? Is it a sales/profit driven company? Evaluate your intellectual property (IP) portfolio. Challenge true market (customer proven) value of your IP. Focus on determining which technologies are truly unique and address unmet customer needs. Map your footprint to market needs and match your geographic capacity to local market demand. Try to unlock opportunities to better serve local demand. Highlight unique and highly efficient manufacturing capabilities (innovative equipment, novel processes). Understand the strengths and weakness of your competitors. Identify areas for competition. Clearly estimate and articulate your chosen growth trajectories. Leverage surveys and research databases, such as the Nice Insight Surveys, to understand how you size up against your peers. Know your target market as well as adjacent markets and geographies. Completely understand the strategic objectives and business drivers of your major customers. This will help to uncover growth opportunities. Find better ways to serve the needs of your customers as they grow and expand. Based on a given organization’s assessment and research, where the best near-term opportunities exist and what the company needs to do to capture them becomes more evident. A company with a strong operational excellence culture, heavy investment in efficient manufacturing technology and excess capacity would likely focus on capturing organic growth through aggressive marketing and sales. Strategic planners are often faced with a critical choice; building capabilities in-house may provide the most control, but that is often a longer-term alternative — it takes more time. Acquiring assets or companies is a popular route to faster growth, but a strategy predicated on acquisition can have integration risks. In Nice Consulting’s view, the best acquisitions are ones that fill a predetermined need, not just a financially lucrative deal or opportunistic buy. Prudent strategists looking to assess a sound growth plan begin by performing an internal capability assessment and conduct market or competitive research. The classic geographic rules no longer apply. Historically, the vast majority of CDMOs resided in North America and the EU, where the bulk of drug spending and consumption occurred. Asia was the place to find more economic production of generics or other price sensitive drugs. However, this is no longer the case; North America is becoming more cost competitive, with newer, more effective technologies and manufacturing practices, likewise Canada is seen as an attractive manufacturing region. Manufacturing in Europe has become more challenging, with heavy regulatory and public pressure burdens. On the other hand, Asia is part of a serious consumption market with ever-improving manufacturing assets. The major Asian CDMO players are part of large complex of business conglomerates operating in a multitude of business sectors. Any conversation concerning growth in the pharmaceutical contract services industry is increasingly a global one. According to the 2016 Nice Insight CDMO Outsourcing Survey, respondents clearly indicated the global nature of the business. Nice Insight analysis of the data indicates that study participants leverage CDMO services on an international scale. 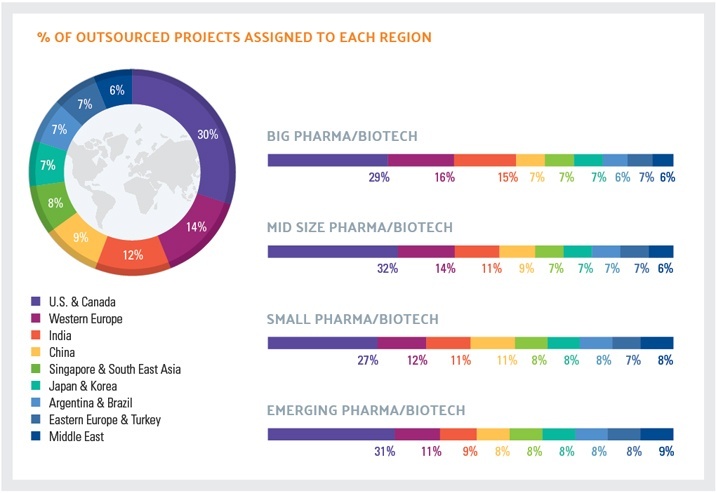 No surprise that most of the survey respondents (30%) source projects in North America (U.S. & Canada) followed by Western EU (14%); with the remainder dispersed relatively evenly among economies and regions beginning to develop their own pharmaceutical industry — India, China, SE Asia Japan/Korea, Argentina/Brazil, Eastern Europe/Turkey and the Middle East. Regardless, while growth is necessarily a global proposition, it should not be considered an end-goal. Growth executed well should be aimed at achieving reach, scale and capability in quantities sufficient to sustain long-term profitability and stakeholder value. Of course, one could always achieve growth the old-fashioned way, or by selling more. Certainly a simple proposition and a popular building block of growth, but the “how” to sell more is where complexity comes squarely into play. For example, branded pharma is increasingly pursuing life-cycle management tactics to extend the market lives of formulas or molecules under their control. Another feature of this path to growth is the fact that if successful with regulators, reformulation can extend the data exclusivity of the product. Selling more can translate into expanding entire new product lines and adding them to operations. One manufacturer, superb at aseptic filling and finishing of vaccines, might invest in another biologics-based product line to add dimension to a portfolio based on core processing capability. For example, Baxter made a $1 billion bet in this direction and expanded in a big way by constructing a dedicated plant in Georgia to process and sell albumen, the groundbreaking immune system therapy. Success in large part will be based on sound strategic planning – picking the right path for your organization based on your strengths, weaknesses and market opportunities. Contract development and manufacturing companies have been pursuing a deliberate strategy of acquisition to achieve the technical ability, capacity, scale, flexibility and market penetration required to compete for the industry’s biggest and most sophisticated contracts. CDMOs and CROs have been acquiring capability to achieve the end-to-end integrated services that the world’s drug owners are demanding. 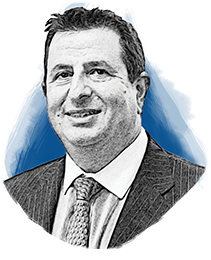 Dimitri Drone, Partner, Global Pharmaceutical and Life Sciences Deals at PWC, said in his May 2016 M&A activity report, that headline worthy pharmaceutical and life science deals will continue past 2016 as fertile ground for negotiation. “However, the first quarter of 2016 experienced a steep drop in both the volume and value of deals from the prior quarter,” said Drone.10 The question is, will this be a temporary lull or will it continue, and if it does for how long? Ultimately, there is no single pathway to growth and not all companies will succeed. Success in large part will be based on sound strategic planning – picking the right path for your organization based on your strengths, weaknesses and market opportunities. Choose your path carefully, is a mantra to live by. Decisions and strategies must be based on careful analysis and sound data. Armed with the right tools and best information, strategists can now create personalized niche businesses built around core strengths, technical acumen, integrated services and geographic placement. If pursued thoughtfully, the rewards are great and will be shared by a few well-defined CMO/CDMO leaders of the future. Global Pharmaceutical Industry Report 2010, Progressions 3.0. Rep. Ernst & Young. 2010. Web. 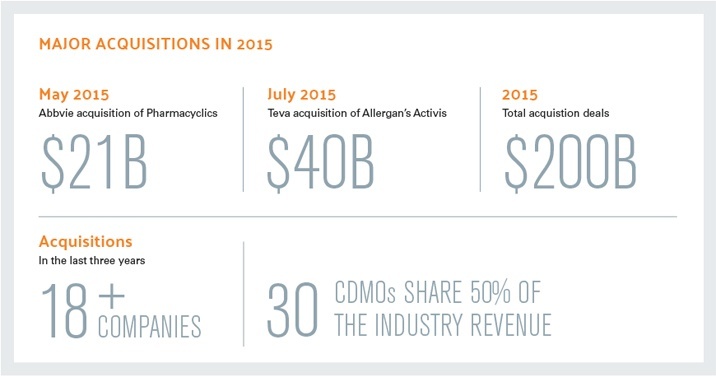 Contract Dose Manufacturing Industry by the Numbers, 2015 Edition. Rep. PharmSource. 2015. Web. “Pharmaceutical Contract Manufacturing World Market to Reach $79.24bn in 2019”, New Visiongain Study Predicts. Visiongain. 10 Feb. 2015. Web. Cheng, Jonathan. “Samsung to Invest $740 Million in New Biologic Drug Factory.” The Wall Street Journal. 27 Nov. 2015. Web. Kuehn, Steve. “Georgia’s New Peach: Baxter’s Covington Plasma Products Facility.” Pharmaceutical Manufacturing. 1 Jan. 2014. Web. Codexis Reports Financial Results for the First Quarter of 2016. Codexis. 9 May 2016. Web. Shanley, Agnes. “The Future of Contract Services.” Pharmaceutical Technology. 1 Feb. 2015. Web. “AbbVie Completes Acquisition of Pharmacyclics.” PR Newswire. 26 May 2015. Web. Miles, Bruce. “Mergers & Acquisitions Protecting the Core and Maximizing Value.” Pharma’s Almanac. 2016. Web. “Pharmaceutical and Life Sciences Deals Insights Quarterly Q1 2016.” Pharmaceutical and Life Sciences Deals Insights Quarterly. May 2016. Web.